Melville House Publishing, Brooklyn, 2011, 232 pp. But where MISS LONELYHEARTS is a tour de force in the short-short category (58 pages in a recent New Directions edition), Kurkov has given us a treat of a full-sized tragicomedy about struggling writer Viktor Zolotaryov in chaotic, mobster-infested Kiev of the 1990s. But first there is the penguin. You see, our protagonist, Viktor Zolotaryov, girlfriend gone and perhaps lonely, seeks company in one penguin put up for adoption by the financially-failing city zoo. Misha, the penguin comes home to his flat. Somewhat surreal--Viktor draws cold baths in the tub for Misha--but after a while, the reader lets go of disbelief. It works. Viktor's job is to write obits in advance for prominent people. True, American newspapers do the same to keep from being caught flatfooted, but in modern-day Kiev, something more sinister is happening: People whom Viktor writes up start to die off, too soon. Viktor gets even more uneasy, more skeptical when his editor begins to "help" his obit writing by giving him dossiers for people on the writer's assigned lists. Presumably the unsourced dossiers originate from state security agencies. Kurkov deftly builds an atmosphere of paranoia, keeping the violence off-stage and giving Viktor crumbs of tantalizing suspense. Despite it all, Viktor enjoys Misha's company even more. Wonderful scenes show the two going outside for a snowy walk and Misha finding a swimming hole in a nearby frozen lake. Complications in Viktor's life keep building. He is left with a young girl, Sonya--whose chief joy is the "telly"--when her father disappears "until the dust settles..." Viktor hires Nina, a young attractive nanny for Sonya. Misha, in his black-and-white penguin suit, become a professional mourner at the funerals of Ukrainian mafia types. And much more. Finally, Viktor reaches an epiphany: His days, too, might be numbered. So in a reversal, he loses his fear to live and die in Kiev. Kurkov shows his mastery, pushing down the narrative throttle for a rousing finish. 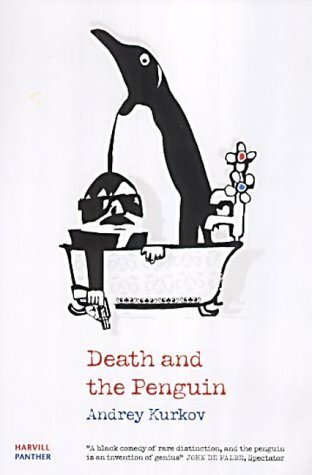 You are warned: The ending has a Casablanca (the movie)-style wow to it and with Viktor's final declaration, the reader sees how Kurkov has worked everything in DEATH AND THE PENGUIN up to that one sweeping moment. Nathanael West would approve!